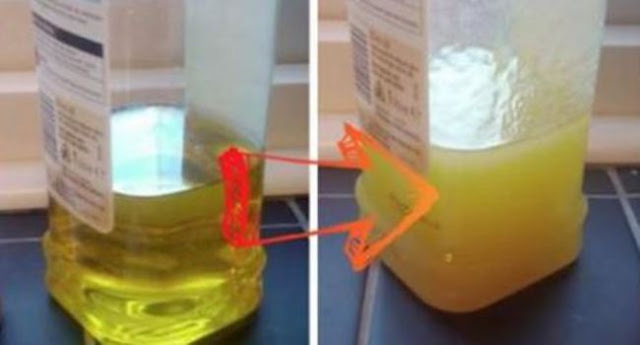 Don`t Poison Yourself – Here`s How To Recognize Is Olive Oil FAKE OR REAL! Olive oil has many health benefits, ranging from smooth skin to a healthier heart. However, many news articles have been released lately revealing that several top olive oil brands have actually been using cheap, inferior oil in their bottles. Not only are they selling not- extra virgin olive oil in virgin olive oil bottles, but some brands have even been caught diluting their olive oil with soybean oil to make it cheaper. f course, fake olive oil does not provide the same health advantages as real olive oil, so it is important to know if you have the real thing or not. Here is how you can tell whether or not your olive oil is genuine. Real olive oil cannot always be identified by taste and smell alone. However, fake olive oil sometimes can be noticed. If the olive oil smells moldy, musty, or winey, it is most likely to not be real olive oil. Familiarize yourself with the taste and smell of real olive oil, so you can start to notice if an olive oil that you buy smells wrong. However, olive oil has a variety of flavors and smells, so it can sometimes be tricky to find real olive oil. This test is often recommended for people who want a quick and easy way of telling if your olive oil is real and pure. Olive oil is high in monounsaturated fats, which get very cloudy and thick when they are in the fridge. So theoretically, if an olive oil is real, when it is in the fridge, it should get thick, and possibly even solid. However, this test is not always completely reliable. Many reputable olive oil manufacturers winterize their product, which means that they remove the agents which cause the olive oil to thicken up, so people can use it in cold climates. Also, olive oil which has high levels of monounsaturated fats can be cut with low-grade fake oils, and it might still get thick in the fridge. So ultimately, the fridge test is useful, but it is not entirely accurate. You may be wondering what all of the fuss is about if you are not a gourmand since most fake olive oils still work relatively well as a cooking oil. However, fake olive oil can actually harm your health. High heat techniques are used to create canola, sunflower, and vegetable oils, and these techniques can produce carcinogenic byproducts. Sometimes, olive oil is altered with olive-pomace oil, which is an extract from waste products and is refined with chemical solvents. The processes used to create these fake oils often result in harmful benzopyrene components, which cause intracellular oxidation and can mutate damaged cells into cancerous ones. Though there are several ways to notice fake olive oil, the only way to be absolutely certain that it is real is to buy olive oil from trusted sellers that are certified by an unbiased third party. Though taste tests and fridge tests are helpful, they do not guarantee that you will avoid the health hazards of fake olive oil. Oils with a seal from the Australian Olive Association, the California Olive Oil Council, or the Italian Protected Geographical Indication are trustworthy, real, olive oil.